"Chemists employed by the police can do remarkable things with blood. They can weave it into a rope to hang a man." When I open the yellow pages of a venerable paperback or a timeworn hardback, I always gaze briefly at the dedication in front and ponder what forgotten, often domestic, stories prompted a writer to permanently inscribe a book to a Peter or Mary. Every now and then, these inscriptions are accompanied with a cursory explanation, "in memory of a perfect holiday" or "as a token of appreciating for allowing me to draw on your expertise of the poisonous Golden Dart Frog," or the person on who this diminutive honor is bestowed was a rather well known personality himself – in which case the story pretty much tells itself. But they seldom, if ever, have any bearing on the content of a book, nevertheless, I couldn't help but think of the people to whom Anthony Abbot dedicated The Murder of Geraldine Foster (1930) as I went from chapter to chapter – and I will divulge the reason for this near the end of this post. The grisly murder of Geraldine Foster began as a routine missing persons case when a young woman, Betty Canfield, reports that her room-mate has gone missing and since the declarant is a niece of a friend of Thatcher Colt the case ends up on his desk. But before I continue, I have to make an annotation here on Thatcher Colt who's crudely drawn character in his first recorded outing. In the previous novel I read, About the Murder of a Startled Lady (1935), he was a sharply dressed, upper class commissioner of police – who relied on thorough police work and sound forensic science to bring a case to a satisfying conclusion. He's still one of the best-dressed, most sophisticated policeman on duty, but here he depends on third-degreeing information from an unwilling suspect and questionable pseudo-scientific methods. This unfortunately ended up devaluing an otherwise class-act detective story with a dazzling plot from superb to merely excellent. It didn't help, either, that Colt was making a series of incredible, rarely substantiated, assumptions deductions like working out what brand of ink was used on a letter by merely glancing at it – turning him into a Philo Vance or Ellery Queen clone with a badge. But let us return to the story. With an official report to set the wheels in motions, New York's finest begin sifting through the last reported moments of the missing girls life, questioning family members, interrogating friends and putting everyone else even loosely connected with the case under the gravest of suspicion as they slowly, but surely, uncover a slew of bizarre clues – ranging from a torn-up blackmail note to the cadavers of six doves stained with human blood. These clues all point like a neon-sign post to an abandoned house, where the walls are covered blood, and a shallow grave near the site in which the murderer deposited the denuded body of Geraldine Foster – hacked to death with a double-bladed ax with a pillow-case wrapped around her head. The elaborate plot is pleasingly entangled in its complexity and the inducement for the murderer to make a bloody mess with a clumsy ax, strip the body and dress her split face with a pillow case before dumping her in a shallow hole in the ground are logically explained – and really is what you hope to find when you begin flipping through the pages of a detective novel. What holds this book down are the aforementioned third-degreeing and exploration of pseudo-scientific mumbo-jumbo. I wouldn't have been surprised, or shocked, in the least if Colt would've whipped out a volume of Cesare Lombroso's theories and a ruler to measure facial features in search for hereditary traces of guilt. But what really casts a dim-light on these proceedings, is the fact that the commissioner has an incredible dense district attorney looming over his shoulder, whose mind runs along a single, unbending track with as only destination strapping someone in the electric chair to further his career, making this even a bit of an uncomfortable read at times – which made me wonder throughout these portions of the story what the people on the dedication page thought of this book. Abbot dedicated to the book to the standing army of New York City, the police department, but what did these men think of a police commissioner pumping a suspect full of truth serum after keeping him up all night – hoping to break-down the strong minded, individualistic personality of this person? It was noted in this very book that third-degreeing and intimidating a suspect were already frowned upon as an investigative method and inadmissible in a court of law, but nonetheless incorporated them into the plot and making them run the risk of tainting a possible case against the actual murderer. Not really reflective of proper policework. Plot-wise, it comes dangerously close to being absolutely brilliant, but the modus operandi of Thatcher Colt is problematic to say the least. Still, if you're a fan, like me, me of those elaborately plotted mysteries from the Van Dine-Queen School of Detection than the plot of this book warrants your full attention. "We only die if we're forgotten about. As long as someone, even one reader, remembers us... we're immortal." On August 29, 2010 Albert ("Appie") Cornelis Baantjer passed away after a brief, but exhaustive, duel with the specter of death and as a commemoration of the first anniversary of his passing, I announced the intension to post a review on that date – with an open invitation attached to it to clog the live feeds of the blogosphere that day with book critiques. Only two of my confreres officially gave the heads-up that they will be participating in this little tribute, but I hope they aren't the only ones who will be submitting book reports. Yes, I'm mindful of the fact that I posted this a day before the actual date, but there's a particle chance that I won't be able log-on to the web tomorrow and I'd rather be a few hours too soon than a day too late with this tribute – and isn't that thought more important than a number on a calendar? Oh, and before you read this review, it's advisable to take a look at the previous post first. 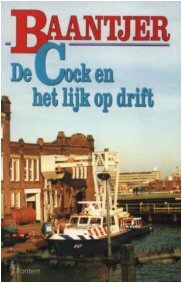 The book I plucked randomly from my overpopulated shelves for this testimonial is Het lijk op drift (The Corpse Adrift, 1998). It's a novel from the later period, in which the plots habitually kow-tow submissively to the tyrannical reign of a thriving formula, however, what was done with this particular story attests my assertion that even the formulaic books are not entirely without interest. The opening chapter is unusually busy, in which a grumpy DeKok and Vledder wrestle themselves free from the warm embrace of their blankets and head for a malodorous alley where two policemen found the body of a man with a blood smeared shirt, but before arriving at the scene of the crime the victim rose up and walked away – leaving two rookie cops flabbergasted. Back at the precinct, the detective duo is confronted with a man, one Gerard van Nederveld, who reports his widowed mother missing and a message from the water police informing them that they've dragged up a dead woman from the murky waters of the IJ (pronounced as AY) who had a note among her possessions with DeKok's name scribbled across the surface. Needless to say, these spate of crimes are interlinked with eachother and the victim is swiftly identified as Alida van Nederveld-De Ruijter, the widowed mother of four grown children reported missing by her eldest son, but the family turns out to be as dysfunctional as your typical, 1920s aristocratic inbred family – rive by a mutual dislike for one another. The source of this animosity was probably the family's father, an indiscriminate collector who pumped nearly all of their money in his hobby and was not averse to employ unsavory underworld characters to acquire a particular item that caught his fancy, and was also dragged from the IJ a year previously. At first, his death was filed away as an unfortunate accident, but the autopsy on the remains of his wife turned up a couple of broken cartilage rings indicating death by strangulation – and suddenly DeKok and Vledder are burdened with what appears to be a double homicide. Even though the plot somewhat stagnated after this opportune set-up, there's still more than enough pleasure derived from Baantjer's storytelling and the characters that inhabit this story. The fractured shards that was once the Van Nederveld family showed that he was still interested in characterization at this point and it's always fun when he brings members of the Amsterdam penose into a story. The inevitable dénouement was all right, but lacked finesse and suffered a bit from a too obvious a murderer. Nevertheless, the motivation for no less than three murders and the emotional aftermath made for a satisfying conclusion as DeKok relates the entire history behind these crimes. While The Corpse Adrift is not Baantjer at his finest, I think it has merits and it was fun to tag-along with DeKok and Vledder again for the first time in over three years. As I said before, it was Baantjer who lit the furnace in which my undying love for the detective story has roared ever since and have always felt very much indebted to him. "There's nothing like the story of ghostly murder and brutal death, by forces unseen, to unsettle the minds and souls of our community." Over the past few weeks, a fellow connoisseur in crime, who operates under the moniker Puzzle Doctor, launched an ongoing campaign to beat the drum for Paul Doherty – an educator and historian who draws on his professional knowledge to craft historical mysteries saturated with seemingly impossible crimes. At first, I endeavored to be strong, resolute and stalwart in the face of this temptation that was put before me, but after the first victim of the docs sales pitch dropped without a fight I knew it was time to take the road of least resistance and just give in. 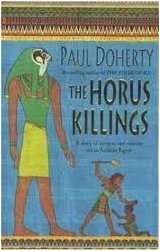 However, instead of stepping back into medieval Europe, which seems to be the backdrop for a considerable chunk of Doherty's output, I took a trip to warmer climes – and settled on a story from one of his series set in ancient Egypt. The torchbearer in these books is a respected chief judge, Amerotke, who's assisted in administrating justice by several henchmen, among them a dwarf named Shufoy and the raunchy Prenhoe, who take up the legwork that is required outside of the exalted circles of society. The parallels between Robert van Gulik and Bertus Aafjes are easily drawn, but the resemblances are superficial as the character of the judge perfectly stands on his own, even though he's, at times, the only real personality in the story as the other characters are rather flat, and the setting naturally gives the story an altogether different flavor. Doherty's expertise and passion for history expresses itself in the setting and the details of every day life briefly resurrected a civilization from thousands of years ago. The Horus Killings (1999) is the second entry in the series and takes place after Hatusu, the widow of Pharaoh Tuthmosis II, ascends as first woman the thrown after having lead a victorious army in a bloody war with the Mitanni – which is interpreted by her followers as a sign that the Gods are in her favor. But to make her divine rule undisputed, she needs the support from a circle of religious leaders, who hold an opposing view on the interpretation of definitive signs from the Gods, but an inundation of brutal killings at the Temple of Horus is endangering the first reign of a Pharaoh-Queen – as scholars are turned into human torches, flasks of poisoned wine are passed around and a Divine Father is murdered in locked room on the top floor of a garden tower! Judge Amerotke has more than enough workload with a murderer who assiduously dispatches people towards the Far Horizon, but there are also two unconnected subplots that hover inconspicuous in the background. The first of these problems concerns the semi-impossible disappearance of two brothers from a maze, but the solution is pedestrian and a lame plot-device to resolve a touchy murder charge issued by the influential father of the boys against the son of another important person. A legal dispute that arose when a woman remarried after her abusive spouse was reported killed in battle, but turned up very much alive, spun out in something more interesting, however, hardly satisfying for someone who reads Bertus Aafjes. That's pretty much the overall theme of the entire plot. The problems and challenges facing Judge Amerotke are cleverly devised, but the solutions failed to excite me – even if they weren't bad at all. The crux of the secret behind the murder in the locked garden tower is perhaps not a revolutionary one, but I tend to like it and the presumption everyone made on the ideal escape route from such a building was very perceptive on the authors part. I just wasn't blown away by it. In summary, the solutions, for the most part, lacked inspiration and the clueing was too sparse to be really satisfying, but a writer who loads a detective novel with semi-impossible disappearances, a seemingly supernatural murder in a locked tower room and a baffling dying message is a man after my own heart – and someone who can probably do better than this. Now don't get me wrong, this still an extremely readable and fairly clever plotted story, and it was a delight to come across yet another contemporary mystery writer who takes joy in setting his character loose in a mazelike plot. Definitely going to read more of Paul Doherty's locked room mysteries in the very near future. Let the reader beware: extremely vague ramblings are ahead of you! Recently, Xavier Lechard added an addendum to a response he compiled earlier this month to the projectile vomiting an article signed by Philip Hensher, in which the savant took a fresh and much needed stance by opposing the unchallenged conventions of the rule bound mammoth that is the crime genre – and labeled its perfervid followers as the un-evolved troglodytes they really are. But as Xavier already spewed his cerebral guts all over the article, there's not much left for me to add except to seize this opportunity to make one or two general observations of my own. In the opening of his addendum, Xavier restated one of his previous observations that the genre being "rule-bound" doesn't mean it is necessarily adverse to originality and innovation, but I think that is putting it weakly – since the genre would've never prospered as it once did had any of the practitioners in the field taken serious notice of the scribbles produced by S.S van Dine and Ronald Knox. Mysteries were virtually unique as a genre fiction during their golden period in the fact that they were hard to define and had a scattered fan base. For decades, a discussion raged on what constituted as a mystery as the wings of the genre seemed to encompass the entire literary globe. 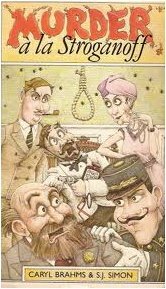 Within the scope of the crime-ridden genre itself there were many different denominations: the fair-play whodunit, action packed thrillers, inverted crime stories, gothic novels of suspense and maidens in distress, police procedurals, rogue adventures, spy thrillers etc. This is not a problem found with gritty westerns, science-fiction yarns, blood curdling horror stories or sweet, diabetic inducing, romance novels. They are, for the most part, what they are and still easily identified if they crossed-over in unfamiliar territory – where as the detective story blends in almost naturally with every surrounding it is put in. The prime example of this genre bending is, of course, Isaac Asimov's Caves of Steel (1954), which places a traditionally plotted mystery in a futuristic setting peppered with social commentary, but you could just as well write a legitimate detective set in Transylvania featuring a protagonist who has to exonerate Count Dracula from a murder committed in a locked and nearly impenetrable castle tower – whose only point of entrance is a tiny, top-floor window large enough for a bird or bat to pass through. A creative writer can pull it off. As far as rules go, I have pretty much given up on them. Until recently, I clung to the necessity of a plot and strict fair play, however, that proved to be incompatible with a lot of writers and books I absolutely love and adore (e.g. Conan Doyle, Maurice Leblanc, Rex Stout and H.R.F. Keating). I still consider cleverly plotted detective stories that play fair with their readers as a personal favorite, but that's just a preference for one of the many forms the genre can be molded into by a talented pair of hands guided by an intelligent and imaginative brain. That's how I see the genre these days... as a mass that can be molded in any shape you want and should provide a gifted writer with unlimited freedom. Lamentably, that's a potential that is rarely tapped into these days and there's not much left of that once majestic, free-roaming bird who soared over the printed pages of nearly every genre after it was captured, clipped and put in a cage too small to even stretch it wings properly. Enter any bookstore, and it's the same old, same old. So called literary thrillers saturated with character angst and lengthy, pointless descriptions of absolute nonsense. No imagination. No experimentation. No longevity. And there's where you find the true tragedy of this problem. The people who threw themselves up as innovators with the purpose of "transcending" the genre are effectively bleeding it to death and hopefully their publishers will take notice, before it's too late, that the new generation of readers aren't all that interested in these self-proclaimed, literary masterpieces – that make pungent comments on society and whatnot. I realize that it's very vulgar of me, Ho-Ling and Patrick to admit, openly and unapologetically, that we read mysteries mainly for our enjoyment, but perhaps our generation simply isn't literate enough to appreciate lengthy descriptions of angst-ridden childhood recollections, bladder problems and CD/DVD collections. As my fellow aficionado concluded, we should (or rather they) make the tent bigger and be more inclusive as well as stopping with that childish, unfounded phobia for the "I" word, but then again, maybe we're better off if the genre, as it stands now, withers away so we can begin anew. And on a side note: I'm midway through another impossible crime novel (it's not an addiction, I can stop whenever I want!) and the review will be up within the next two days or so. "...it leaves us under the necessity of explaining how this murderer entered and left a locked room, how he entered and left a room the door and windows of which were under constant observation, finally how he killed in the open, in the presence of a witness, without betraying himself further than by a gleam of his weapon." As noted in a previous review, Scottish born physician Robert McNair Wilson had a second vocation as a prolific mystery novelist, under the nom-de-plume of Anthony Wynne, whose forte was the locked room ploy. Unfortunately, for him, his tendency to over dramatize scenes, which are described in a dry, humorless style and littered with pasteboard characters, denied him the chance to bask in the kind of fame that John Dickson Carr, Hake Talbot and Edward Hoch enjoy within the ambit of the genre – and I never expected more from him than a handful of good ideas interred in a very flawed story. 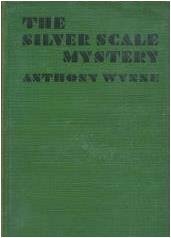 The Silver Scale Mystery (1931), also published under the title Murder of a Lady, showed me that you are at folly when you base your judgment of a writer on a single book – as this one was an out-and-out improvement on The Green Knife (1932). The characters seem to have been aware that they were not, in fact, stage actors in a bad Victorian melodrama and the writing was very sober – although the string of intended suicide attempts, to exonerate family members who've fallen under suspicion, were shades of the authors true nature. But on a whole, Wynne's faults were reduced to a minimum, while his strengths took the center stage. This has perhaps to do with the fact that the backdrop of the story are the Scottish highlands, where he spend the days of his youth, which translates itself into a dour atmosphere that is befitting for the surroundings of the story – especially the castle in which the murders take the place. The first victim, Mary Gregor, sister of the laird, dies before the opening of the story when she's struck down by a sharp blow in a sealed bedroom. But despite this early, off-stage casualty the body does not remain a lifeless, faceless pawn who was sacrificed in the opening of the game, but is effectively recalled to life through the reminisces of the people who surrounded her in life – which only serve to garner your sympathy to whomever was so kind to extinguish that life light. Mary Gregor was not a hard-bitten, cold-mannered matriarch who ruled the family with a cast-iron gloved fist, that would've been forgivable, but acted a benevolent dictator who "had a way of restating the most cruel slanders in the kindest terms, assuring you that she had forgiven faults which existed only in her own invention and pleading with you to be equally generous." At the time of the murder, she was laboring ardently on forcing an irreparable breakup between her nephew and his wife in order to take control of their two-year-old son, Hamish, to indoctrinate the poor kid with her fundamentalistic religious views and their family values – something she had done before in the past. A contemptible woman to say the least, but it demonstrates that Anthony Wynne was capable of exalting himself above sordid melodrama and cardboard characters – which obliges me to rephrase a comment I made in the book report I posted on The Green Knife. I stated that the tragedy of Anthony Wynne was that he was, at heart, a writer who belonged to a different era and had the misfortune to arrive at the scene of the crime long after his time had come and gone, but had the quality of this book turned into a trend he wouldn't have attenuated from our collective memory – at least within the mystery community. Not that he would've been a threat to John Dickson Carr's claim to the thrown, but he would've been definitely considered as serious competitor as his imaginative plotting evidently benefited from the sobered down writing and tighter characterization. The murder of Mary Gregor is as baffling a locked room mystery as any in the case files of Dr. Gideon Fell or Brooks U. Banner, in which there's not just the question of how the murderer obtained access to a closed space, but also why the victim locked herself in a stuffy room on warm summer night and the meaning of the herring scale found on the body – which leads to local superstition that implied the involvement of the legendary merman, known as "The Swimmers," in the execution of this inexplicable murder. This set-up would be, by itself, enough of a problem to pad out an entire novel with, but Wynne provides the plot with two additional, seemingly impossible murders, to spice up the plot. Both victims were policeman in charge of apprehending the murderer, but every time one of them was ready to secure an arrest he's murdered. The skull of the first investigative officer is shattered while alone in a room that couldn't have been entered without passing Dr. Eustace Hailey, and his successor was slain outside the castle walls in front of a witness who failed to notice the assailant dealing the fatal blow. The solutions to these miracle slayings are simple, but convincing, which is the hallmark of a clever and well-executed locked room mystery and I loved how, at first, I had my doubts about the method, the identity of the murderer and the motive. I was afraid that this excellent story would end with a dud, but that fear proved to be unfounded and the complete picture of the crimes is as intriguing and satisfying as the problems it consisted of. The only things that can be said against this novel is that a) Dr. Hailey functions mainly as an impartial observer b) one of the main clues should've been divulged a lot earlier on the story c) the implication of "The Swimmers" should've been played up more. You know, like Carter Dickson and Hake Talbot would've done. As a closer, I want to share with you a little treasure that was tucked away in my copy of the book for over 80 years! 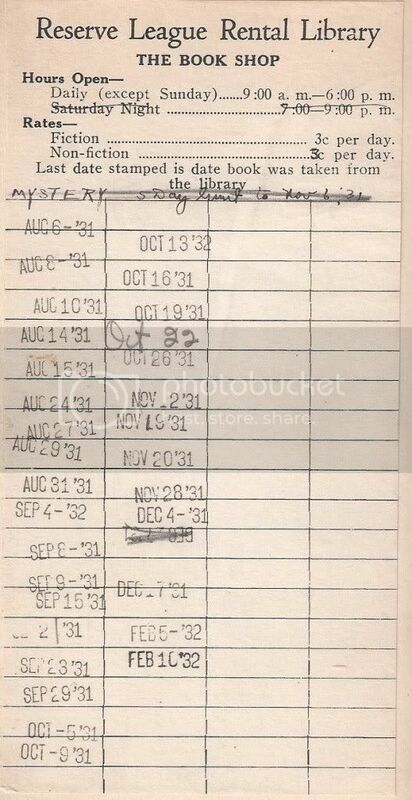 When I examined the book, I noticed that there was a library card from the 1930s glued on the inside. The first stamp dates from August 6, 1931 and was checked out over thirty times before it was borrowed one last time on February 10 of the following year. "It confirms how these books were widely read, though comparatively little sold. A mystery that sold but 2000 copies to libraries in the U.S. could have been read by 60,000 people conceivably. mystery reader, including John Rhode's The House on Tollard Ridge. All rentals." Well, I got an excellent, hard-to-get impossible crime novel, in fair condition, with a piece of history attached at a fraction of the price the book normally sells for (note that the only copy currently on sale goes at the tune of four hundred bucks). Yeah, you can consider me a happy boy! "There will be blood on that stage... unless..."
I alluded in a previous blog post to the possibility that I had come up with a contemporary compeer in Herbert Resnicow to William DeAndrea and Bill Pronzini, and having just finished reading a third classically styled, exquisitely plotted detective novel with his name plastered across the dust jacket I feel vindicated in my premature assertion of the man. He was perhaps one of the last true GAD writers the Western mystery genre has seen. The Gold Curse (1986) has the colossal union of the behemoths Alexander and Norma Gold attending a charity performance of the opera Rigoletto, at a thousand bucks a seat, featuring an all-start cast and crew, but the backstage atmosphere is tainted with strife, rivalry and bloodlust – and the final aggregate of this disastrous, star-lit assemblage is an impossible stabbing during the final act of the play! But I passed over the rapid succession of brief, but evocatively, written chapters preceding the murder here, in which the tension is gradually mounting during the first two acts and you can feel the looming presence of the Grim Reaper waiting in the wings for his cue. Beautifully done! Resnicow also draws parallels between the performers and characters they're portraying by noting that, when the characters are cursing one another, they're speaking with the vitriolic tongues of the opera singers themselves – which was enough by itself to want an encore before the curtains had even closed on the first act. Well, there you have it! An audacious murder committed under seemingly impossible circumstances, during a rendition of a famous opera, with thousands of eyewitnesses in attendance and four running television cameras, but none of them spotted the knife wielding fiend when the victim received the fatal knife thrust – including Alexander Magnus Gold. Needless to say, this does not sit well with a man whose physic is dwarfed only by the size of his stellar ego, but now that he's a licensed private investigator he sort of needs a client. Not that the unsavory Cretan billionaire, Minos Zacharias, who has his dark motives for retaining Alex and Norma, is the perfect client, but he has to do – although the golden pair are playing hard-to-get as they gamble with a $1.000.000 fee! The ensuing battle-of-wits between the Amazonian Norma and her hardheaded husband against the Cretan billionaire is probably my favorite part of the book. You could argue that it takes up too many pages, but it sets-up a part of the solution and it's just fun watching Norma, "fastest lip on the West Side," bounce snarky comments off on someone not named Alexander – and seizes control of their prospective client. Of course, her partner has to upstage her by showing off his massive intellect and prolonging this clever and witty sequence. 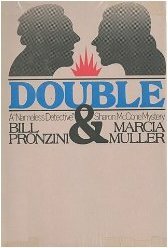 During the second portion of the book, the investigative husband-and-wife team begin to audition suspects for the role of murderer and attempt to reconstruct the events in order to find out the true nature of culprit's invisibility trick – which is both delightfully simple and workable. This gives the plot an edge over other locked room stories with similar on-stage murders, like Christianna Brand's Death of Jezebel (1948) and Ngaio Marsh's Off with His Head (1957), boosting clever, but complicated, solutions. It's interesting to note that Resnicow's locked rooms are set in large open spaces. In The Gold Solution (1983), the sealed crime-scene is an entire top-floor apartment and The Dead Room (1987) has a stabbing in a large anechoic chamber, but he locked them as tight as a drum and the same goes for the stage in this story. It's an open space, in which people are constantly moving around, however, everything plays out in such a way that nobody was near the victim when she was stabbed. Locking up a body in a locked and bolted study or bedroom is one thing, but it takes a considerable amount of skill to set an impossible crime in these spacious environments and he should be commended for pulling it off a second time (his first effort was only so-so). 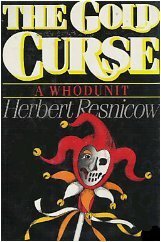 Simply put, The Gold Curse is an astute and amusing romp, populated with both likeable and detestable characters, whom all dance around a scorned opera singer, while one of them plunged a knife in her neck in full view of a sold-out theatre and four running television cameras without being seen – and provides a satisfying and believable solution. The only blotch is that the killer's motive was insufficiently clued, but that's a minor quibble in light of the overall plot. I loved this book, plain and simple. It's mind-boggling that a prolific mystery writer, whose oeuvre consists mainly of impossible crime stories and was even nominated for a coveted Edgar statuette, has been all but forgotten today as he's rarely, if ever, mentioned or revered to – at least not in the digital realm. I'm probably the first reviewer in many years to post more than just a few passing lines on the web regarding his work and that's just a depressing thought. I guess Herbert Resnicow found a new champion and I'll be place a few more orders for his books in the months to come. Stay tuned! "Cannibals," I added, "must be very, very queer people." "Especially," Lynch said peevishly, "cannibals who inexplicably lose their appetite on a dark night on a deserted mountain peak when the job’s four fifths done. Queer indeed!" 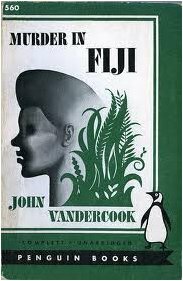 John W. Vandercook (1902-1963) was a foreign correspondent and globetrotter who explored the forgotten nooks and unexamined niches of the world. These voyages extraordinaire were made when the globe was still dotted with blank spots, Terra Incognito, which resulted in paddling the swamps of New Guinea in a native dugout, journeying over the uncharted waters of unexplored rivers on Malaita Island and cutting through the African bushes – resulting in several authoritative books on anthropology and a exposition of his souvenirs at the Brooklyn museum. But he also poured these experiences, as a cosmopolitan adventurer, into writing four detective novels, penned between 1933 and 1959, in which he dispatches Bertram Lynch, a special agent in the service of the League of Nations, and history professor/narrator Robert Deane on dangerous assignments to exotic locations – where death assumes a deceptive air of passivity as it feigns to be languidly snoozing in the coolness of the shadows. Reputedly, these colorful backdrops provide the reader with a sense of danger and perilous situations for the heroes usually missing from detective stories set in the concrete jungle of Ellery Queen's New York City or the sleepy countryside villages like Miss Marple's St. Mary Mead, but the book I just read was a traditionally plotted mystery, situated in an unusual location for a whodunit, instead of a full-blown hybrid – which was a pleasant surprise. In Murder in Fiji (1936), Bertram Lynch and Robert Deane are packed-off to the Fiji Islands where a trail of mutilated bodies has rock the islands. Violent crimes are uncommon on the now harmonious South Pacific slice of Britannia, but the mutilations has the colonials worried that the natives are returning to the cannibalistic customs of the previous generations – and the local news rag is crying for punitive measures against the native inhabitants. A dangerous sentiment that could become a popular one when the fourth victim turns out to be a white man. Enter Bertram Lynch, whose assigned to safeguard the good relations between the natives and colonials by dropping off the perpetrator at the gallows and a preliminary investigation of the latest victim convinces the special agent that he's, in fact, dealing with a savage killer, however, not one that is indigenous to those islands. Vandercook's vivacious writing sketches not only a memorable imagery of the regions vista, but also portrays the natives as actual human beings who are generally nice and sympathetic people – which is a continuation of a tradition that began with Earl Derr Biggers and honored by Clyde Clason. Well, we have an inexplicable succession of detestable mutilation killings, suggestive of a resurgence of cannibalistic rituals among the native inhabitants of the land, set against the backdrop of an exotic location dotted with engaging characters, but does the plot hold up as a fair-play detective story? Yes, I think it does. The clues were more than fairly strewn throughout the story, which made the revelation of the manslayer's identity feel like an inevitability, with the most perceptible one tucked away near the end of the book – when Lynch stages a psychological experiment by staging an ancient ritual during which a local chief is poisoned under seemingly impossible circumstances. Don't expect too much from the solution of that little side puzzle, though, as it was clearly meant as a throw-away clue for readers who hadn't stumbled to the truth yet. Great scene, though! This book is not a monumental landmark in the genre, but otherwise an evocatively written, competently plotted mystery with a pair of amiable, non-intrusive or annoying detectives, who actually have a nice Sherlock Holmes and Dr. Watson vibe going for themselves, chasing an individual who's a truly nasty piece of work – and one with the worst streak of bad luck you've ever seen in a fictional killer from the golden era. Yup. This murderer isn't aided by staggering feats of almost supernatural luck and a series of perfectly timed coincidences, which makes me like this book even more and enough to warrant a further exploration of this particular authors work. So expect more reviews from the other books in this series to surface on this blog in the hopefully not so distant future, but for the next few blog entries I want to look at some other impossible crime stories and locked room mysteries. "The butterflies fluttered in the blackness, like ghosts wandering without a destination." You may remember that a few months ago, I posted a compendium of the strength and weaknesses of Yozaburo Kanari's The Kindaichi Case Files by impartially evaluating three volumes I labeled as good, bad and average, but my contempt for the author tainted the neutral tone I intended to adopt for the review. I won't waste time by trodding over ground covered in a previous blog entry, but will simply point you back to that post in case you want to know why I loath him and it's best you read that before continuing reading this one – in which I'll take another shot at putting my personal disdain aside and objectively critique two more titles from this series. I think I can hear someone sceptically mumbling in the back. The books I opt for in this second-round are The Legend of Lake Hiren (1994) and The Undying Butterflies (1997), which, by themselves, have the framework of a standard, formulaic Kindaichi story, but combined they're lifted slightly above an average effort – as the murderer from the former story resurfaces in the latter and poses an interesting moral question at the end of the second volume. Typically, The Legend of Lake Hiren begins with Kindaichi and Miyuki scoring exclusive invitations to a sumptuous lakeside resort, located at the heart of a secluded valley enclosed by an immense, nearly impenetrable forest with a tottering footbridge as its only route leading back to the civilized world, where the participating members of the traveling group can earn themselves an exclusive and coveted membership once the place officially opens up for business. The participating members of the traveling group include, among other, a former high-school friend of Miyuki, a tacky reporter who goes out of his way to be offense, a kind-hearted doctor with a dark secret, a once promising artist with a morbid fascination for corpses and a gold-digging wife who isn't particular mournful about the sudden and violent passing of her husband – which provides a nice set-up for a good, old-fashioned whodunit. However, the threat of a menacing murder, lurking from the shadows of the valley as the victims are snatched from their midst, one after another, apparently does indeed seem to come from the outside of the confines of their closed circle – as an alarming radio broadcast notified the public at large that a demented mass murderer escaped from his jail cell. The killer was an avid movie fan who snapped and massacred thirteen people in a single night while dressed as Jason Voorhees, and the vale is beginning to sense his presence when a body turns up with his face torn-off! Someone torching down the bridge and them uncovering a second, face-less body stuffed in the fridge rapidly follows this. Kindaichi reasons from the facts that the murderer is now "sealed" in with them and that none of their food was stolen must mean that the escaped madman is a clever ruse and that the actual slayer is among them – and here's where Kanari's blatant incompetence as a mystery writer comes into play. Only a novice would've missed the significance of the shredded faces, a supposed act of random savagery that makes the murderer stand out like a sore thumb, but this could've been solved by taking the personality and modus operandi of the mass murderer into the equation to mislead the reader. The ax-wielding maniac is supposed to be a fiendish movie freak who emulates his on-screen idols and the fact that he neglected to swipe any food from their fridge, after being on the run through the forest for nearly a week without provisions, could've easily been explained away by suggesting that he fed himself with the flesh of the victims – which just so happens to be Hannibal Lecter's favorite snack. This would've neatly obscured the true motive for mutilating the features of the victims, but then again, what else was I expecting from someone who can only produce an inspired idea when he has a book to copy it from – and the remainder of the story is pretty much what you'd expect from a hack like him who desperately clings to his formula. However, I have to give him props for the way in which he handled the final scene with the murderer who wasn't impressed at all with Kindaichi's attempt at an emo-speech and the semi-original twist he spun on the motive that he loves regurgitating over and over again. All in all, this is a pretty average entry in the series, impaired by missed opportunities and a lack of truly inspired ideas, and its only saving grace is that it's associated with The Undying Butterflies – as the murderer resurfaces in that story after the murky depths of Lake Hiren swallowed this persons body and was presumed dead. Note of warning: one of the panels in this story contains a rogue's gallery of murderers from previous cases. The reader is warned. Well, after a stretch of time, in which Kindaichi bumped into a number of murderers, the memories of the grim episode at Lake Hiren begin to dim and accumulate a layer of dust in the attic known as the human brain, but one day he's confronted with a magazine article on a dilettante scholar who rediscovered a rare species of butterfly – and a snapshot depicts the savant standing next to the person he unmasked as the one who was responsible for butchering four people at the lakeside resort. In tow of a reporter, Kindaichi and Miyuki make a journey to the family mansion of the savant, where thousands of invaluable butterflies swarm the heavily guarded premises, and come face to face with the murderer who found employment as an assistant to the residents patriarch, but claims to have no recollection of a prior life – ever since being dragged from a river. Whether this is true or not, it's unequivocal that this individual is neck deep in another murder case when someone begins killing off the members of the family and leave them pinned like butterflies – beginning with the family's 12-year-old daughter! The death of a child, coupled with a motive that is accompanied with a minor, but nifty, twist gives this story a decidedly dark tone. Unfortunately, this atmosphere of doom and gloom amounts to nothing more than a thin film covering a familiar exterior as the plot goes through the motions of a standard Kindaichi story – which makes it possible for regular readers to identify the culprit without even glancing at the given clues. What lifts this story above its basic plot is the inclusion of a murderer from a previous volume, whose hands are undeniably stained with blood but who may be innocent of these butterfly-murders and perhaps even morphed into a completely different person due to the amnesia suffered during a traumatic escape, and a really clever trick to create a unbreakable alibi. Even though he probably nicked that part of the plot from another detective story. Yeah, when it comes to Kanari's hackwork I'm a cynic. 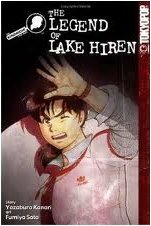 On the whole, The Legend of Lake Hiren and The Undying Butterflies are pretty average fares when tackled separately, but read back-to-back the characters managed to wrestle the plots loose from Kanari's death grip of mediocrity and deliver an overall decent enough story. But more could've been done with them had they been put down on paper by more capable hands guided by a brain possessive of a shred of imagination. "If you call one wolf, you invite the pack"
When I critiqued the cooperative effort Twospot (1978), penned by Bill Pronzini and Collin Wilcox, I dropped a hint that the next nameless tale loitering in the queue was another crossover novel, in which Pronzini and his mystery writing wife, Marcia Muller, had pooled their series detectives – and in preparation, I wanted to dig into one of her Sharon McCone stories first. Well, that didn't happen. The problem that upset my initial plan, is that the book that piqued my interest also happens to be one of a handful of her tomes that is not within the immediate grabbing range of my covetous claws. So I decided this book would be my formal introduction to her characters. What else was I suppose to do? Exhibit more patience? Double (1984) is set at a luxurious San Diego hotel hosting a convention for professional snoopers, who collect their paychecks in the private sector by keeping adulterous spouses under surveillance and nosing around for missing persons, which seems a likely spot for two ace investigators to bump into one another – as well as cueing the cog-wheels of faith to open another can of bodies. The first of these victim fell from one of the hotel spires, four floors to an ugly mess on the cobblestone strewn soil, witnessed by that anonymous murder magnet who recognizes in the remains the establishments chief of security and former associate of Sharon McCone. A lamentable suicide or an ill-fated accident is the prevailing opinion of Elaine Picard leaping into oblivion, but subtle undercurrents at the hotel gives a different interpretation of her death – and Nameless and McCone withdraw themselves from the hustle and bustle of the convention to embark on an exhaustive, perilous quest for the truth without the backing of a client or the prospect of a fee! The story is told in the unmistakable, first person narrative that is the trademark of the private eye genre, but here the perspectives alternate between Nameless and McCone – which is a really nifty recital device when you have two such distinctive characters at your disposal to give the reader a report of the events as they went down. But this also included a drawback for me. I spend half of the book peeking over the shoulder of a character I was already on first name terms with, while the other was a complete stranger to me and this gave me more of a connection with story when Nameless was narrating a chapter – which contained everything I enjoyed about these novels. Pronzini always creates an opportunity to bring up his pulp collection and there were subtle bits of humor here and there (e.g. giving the name of his father-in-law when he invaded an adult book-and-curio shop, although, I would've probably LOL'd hard if he had identified himself as Russ Dancer). Nonetheless, it was a delight to make my acquaintance with Sharon McCone and loved the nickname she stuck nameless with through out the story, namely Wolf, which was lifted from a newspaper article labeling him as the last of the lone-wolf private eyes – and she's the only one who can call him Wolf and get away with it. Nope. It's not what you think. Their relationship is nothing like that. McCone kindles Nameless paternal instincts rather than his amorous ones and it's just a friendship based relationship grounded in a common, professional interest that also happens to fuel their investigation into the death of Elaine Picard. Like I noted a couple of paragraphs earlier, McCone and Nameless work, more or less, pro-bono on this case and even take a financial beating by voluntarily probing the wasps' nest that is the hotel and vanquish some minor evils as they attempt to close in on the truth. These quests include tracking down a mother with her son, after they vanished from one of the hotel bungalows, locating a private club which was frequented by security chief months prior to her death and leaving only two additional bodies in their wake – which should've been a lot higher with these two cursed detectives working on the same case. So you have to applaud them for not causing a small-scale holocaust at the convention! The plot itself wasn't bad, but only the first murder was properly clued (as far as clueing goes in a private eye novel) and the other deaths were an additive of the first murder, but then again, this is not the type of story in which you're suppose to be on the look-out for clues and put down the book to construct a clever theory of your own. You simply have to fulfill the role of silent partner as you tag-along with Nameless and McCone on a very bumpy ride on the road of discovery, and find out how a series of events could've escalated in a murder that ended up wrecking the lives of half-a-dozen people. At heart, this is one of those dark, gritty crime stories but also one of the best of its kinds that I have read. Not quite as ingenious as Hoodwink (1982) or as grabbing as Shackles (1988) though, but close enough to be considered as one of his better stories and one that argued a pretty good case for me to be less picky when it comes to scoring a Sharon McCone novel. If you told me a few years ago, shortly after pledging my alliance to John Dickson Carr and his devoted followers, that there would be a day when I would be reading and praising abrasive, hardboiled private eye novels, I would've probably chucked a string of garlic at your head while hollering, "The power of Edgar Allan Poe compels you!" On a sidenote, I toned down my overblown writingstyle a bit (compare this blog post to the previous one) and I want to know if this is preferable or not. "I am an old-fashioned villain." "Old-fashioned villains are always killed in the end." Death is no laughing matter, especially when it manifests itself in the guise of a callous murderer, but the mystery genre has a long and storied history of making a laughing stock out of the homicidal tendencies of the scythe wielding death-dealer – goaded by the ghouls who relish these abdominal stories. And yes, we're all guilty of this one. After all, who can honestly say they read Leo Bruce's Case for Three Detectives (1936) with a straight face or were not reduced to soft chuckles after strangling a laugh while flipping through the pages of Kelley Roos' The Frightened Stiff (1942)? Caryl Brahms and S.J. Simon, co-conspirators in a series of comical mysteries and historical farces, were two of the malefactors responsible for turning the cloaked embodiment of death into a figure of fun. These literary equivalents of Bonnie and Clyde openly confessed that they intended to keep Londoners laughing during the Blitz and schemed their risible narratives while cremating cigarettes, draining cups of tea and emitting frequent shrieks of laughter – which is why I always refer to them as partners in stitches. Well, if Bill Pronzini is ever going to compile a Gun-in-Cheek sequel, dedicated to awful puns and cringing witticism from hack reviewers like myself, I have secured a spot in it with that one! Their first collaborative achievement as a criminal enterprise came with the publication of A Bullet in the Ballet (1937), in which Inspector Adam Quill and the members of Vladimir Stroganoff's absurd and uproarious ballet company made their first on-stage appearance – as they tangoed with an assassin who insists on killing performers dancing the role of Petrouchka during shows with hundreds in attendance as potential eye-witnesses. 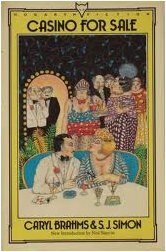 The jocular story telling gelled perfectly with a well-constructed plot, but it was the impresario Stroganoff who usurped the spotlights. A genuinely droll character who gave actes de présence in numerous of their satirical mysteries as well as non-criminal comedies. Casino for Sale (1938) opens with the beleaguered Stroganoff being bamboozled into purchasing a small, dilapidated casino within the vicinity of a recently erected, modish casino and on top of that his newly acquired gambling den turns out to be cesspool of crime. Blackmailers and confidence tricksters have a run of the place, but the indefatigably impresario takes on the competition by inveigling the discerning public into the run-down gaming house with his world famous and celebrated ballet company. But nothing runs smoothly and when Pavlo Citrolo, an eminent ballet critic who moonlights as a blackmailer, refused to give a good notice the promoter recognizes that the situation calls for swift and immediate action by doing what everyone in his position would've done – spiking the critics drink with a sleeping draught and rushing-off to write a laudatory review in his name after safely locking the snoring blackguard up in his own office. So problem solved? Casino Stroganoff receives a commendatory notice from a highly regarded patron of the stage and the decrepit casino becomes a success after all. Well, not quite. When he returned to unlock his office, a speech prepared to logically account for his groggy state and the locked environment, in which Pavlo Citrolo found himself when he woke up from the drug-induced stupor, he finds the strangled remains of the man in what can only be described as a sleuth's nightmare. There was a noose dangling from the ceiling and a gun near the body; there was a bullet hole in the wall and an untouched glass of milk next to a bottle labeled poison; a half-smoked cigar on the mantel piece and the safe door was swung wide open – and guess who the local Inspector Clouseau incarcerated for the murder after his first inspection of the crime-scene? Exactly! Luckily, for Stroganoff, he had the blind foresight to dispatch an invitation to Adam Quill, now retired from the force and making a living as a private enquiry agent, to waste his vacation at the casino – which now has turned into a busman's holiday. Casino for Sale is a rollicking cavalcade of crime, in which the bantering characters and effervescent dialogue decide on who has the brightest sparkle by holding a repartee duel – making this is a fast-paced and breezy story. Unfortunately, as a detective story, the plot missed a beat or two by trivializing the circumstances in which the murder was discovered. The clue filled murder room was fairly quickly accounted for as one of Stroganoff's artistic fits (hoping to obscure the murder as a suicide and abscond any personal responsibility for drugging him) and the banality of the locked room trick was unsatisfactory to say the least. Admittedly, the latter advanced the plot and provided a few chuckles, but I think littering the place with a dozen spare keys would've worked just as well and been less of a disappointment. Nevertheless, these cosmetic anomalies take very little away from the overall quality of the book as it remains a very amusing romp and Adam Quill is a pleasantly assiduous detective – diligently picking up clues, interrogating witnesses and pursuing suspects. It's just that I feel that this could've been a minor classic if Quill also had to explain away the murderous instruments and intriguing clues, one after another, before uncovering the culprit's identity – akin to Carter Dickson's Death in Five Boxes (1938). If you'd compare this book to a casino slot machine, it only missed one of the symbols needed to complete the winning combination that would've hit the jackpot. Oh well, at least playing the game was plenty of fun.